The MAT is a small regional party in Tuscany, advocating the autonomy of the region. It was founded in 1989. It holds no seat in the regional parliament. 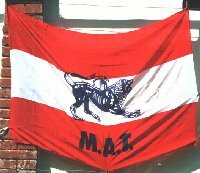 The MAT has used three different flags, based on the historical Tuscan red-white-red flag, together with the "Chimera of Arezzo" (a bronze figurine of about 400 BC, employed as a Tuscan national symbol). The first flag is called the "national flag" and is red-white-red with a small chimera and the party abbreviation . The second flag, of 2002, is red-white-red with the party name distributed over the three stripes, and the party symbol in the white stripe [2,3,4]. The most recent flag is a version of the first "national" flag, showing a larger blue chimera (fimbriated yellow) on the red-white-red [5,6]. There is another movement in Tuscany which is in favour of independence or great autonomy for this region. It reached a certain success in past times, now it is a very tiny party. 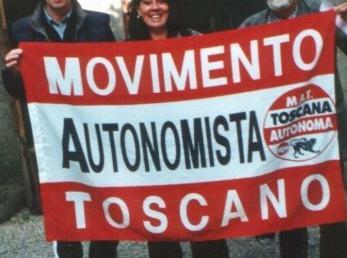 The logo of this movement can be seen at www.mat-toscanalibera.org. 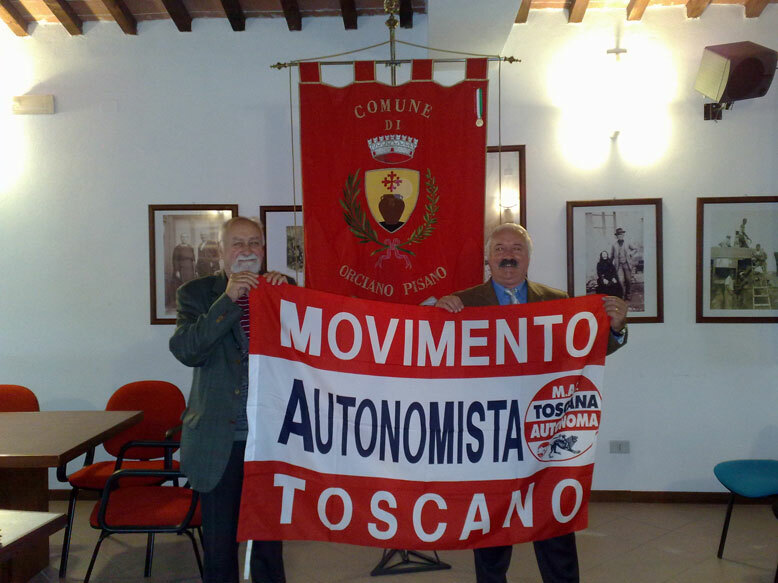 The flag of the movement can be seen at www.mat-toscanalibera.org/newflag.jpg. They have also a "national flag" for Tuscany at www.mat-toscanalibera.org/bandiera.jpg in two variants: with or without "M.A.T." lettering. Now the flag with lettering no longer exists since the flag of the movement is only the one I indicate above. This movement shows an Austrian-like flag (like those of Lega Nord Toscana -- Tuscany Northern League) but with no Lorraine-Medici styled CoA. Instead, it has a reproduction of the Etruscan Chimera known also as "the Chimera of Arezzo" since it was found in 1553 near the town of Arezzo (in eastern Tuscany) a bronze sculpture which is considered a masterpiece of the Etruscan art (now it is at the Archaeological Museum in Florence). The site also indicates a possible "national hymn" for Tuscany: it is "Nessun Dorma!" (or "Vincerò"), a famous aria from Puccini's "Turandot", worldwide famous because of its interpretation by Luciano Pavarotti. Puccini, in fact, was born in Lucca, in western Tuscany.